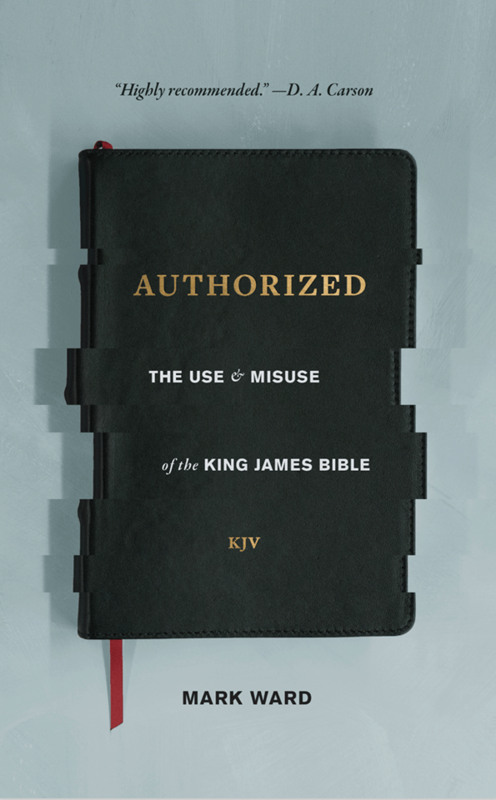 Authorized: The Use and Misuse of the King James Bible by Dr. Mark Ward is a book about whether or not today’s society should use the KJV as a primary translation. He uses lots of situational stories to demonstrate his points and provides lots of examples from Scripture. In this 154 page book, Dr. Ward discusses the KJV with the utmost respect. He isn’t attacking anyone (including KJV-onliests). He isn’t criticizing the KJV translators. He’s respectful of them. Dr. Ward is 100% positive toward the quality of the KJV and the translators. 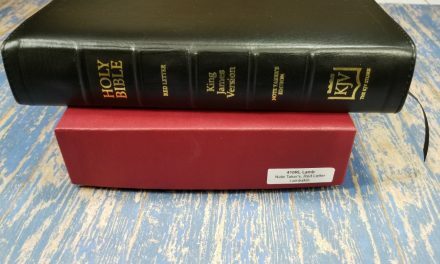 Mark Ward covers the impact the KJV has had on modern society, discussing what’s lost and what is gained if we move away from the KJV as a primary translation. He shows that too many phrases in the KJV need to be explained to the reader or listener and that leaves our understanding open to the interpretation of the teachers. He demonstrates that the greatest problems are sentences that we don’t realize are problems. We think we understand what is being said. It even makes sense in context. Unfortunately, this causes us to misunderstand the context completely. The problem isn’t looking up words we don’t understand. It’s not knowing what we don’t understand. We don’t always notice the difficulties. We can read right over them, assuming we understand. They don’t register. Dr. Ward demonstrates several difficulties through stories and common Scriptures that are often memorized. He does point out that none of them affect doctrine. Just a few verses wouldn’t be much of an issue. The problem is the great number of them. They occur in every book of the Bible. He covers 6 of these issues in detail, discusses 2 stories, and lists 25 others. There are far more that this in the KJV, but these examples are enough to get the point across. He shows many others throughout the book. He isn’t attempting to provide an exhaustive list of difficulties. I’ve been collecting them myself over the past few years and I hadn’t noticed several that he mentions. He shows how language changes over time and how that affects meaning of words and phrases. Often, understanding the meaning of the words doesn’t help in understanding the phrase. He provides many examples of this. Just looking up words in the dictionary doesn’t work. Not even in the 1828 Webster’s Dictionary. Only the Oxford English Dictionary works because of how it shows millions of uses all the way back to 800 AD for anything that even remotely resembles English. Punctuation is another area where the KJV doesn’t match what we’re used to. He shows how the 1769 KJV punctuation makes it more difficult to understand some passages. This is fixed in the New Cambridge Paragraph Bible (which is one reason I recommend it over a standard vbv edition with out-of-date punctuation. It is unfortunate that others haven’t updated the punctuation as well as the 1769 punctuation doesn’t match the 1611 anyway). Even though he’s showing that we don’t understand phrases, words, and punctuation, he also shows that it’s not the fault of the translator’s or the modern reader. This isn’t done to make use feel ignorant. No one is blaming us for not understanding the changes in English for the past 400 years and no one is blaming the translator’s for not being able to predict those changes. One of my favorite sections covers the reading level of the KJV. I’ve read many times that it’s either a 5th or 12th grade reading level (depending on the agenda of the writer). Dr. Ward demonstrates how computers actually perform a reading-level text and shows the problems with testing the KJV. I’ve always placed the KJV in the 12th grade reading level and said that machines don’t know that words have changed meaning and that 5th graders are not taught to look up the meanings of words they think they know. Dr. Ward takes this much further with a detailed analysis, comparing words, sentence structure, punctuation, and even typography. I especially like his points on language in the vernacular. He demonstrates from Scripture that a translation should be in the vernacular and that the KJV was written in the vernacular of a different audience. God spoke in the vernacular. He also shows what the KJV translators themselves thought about translations and discusses what they expected to happen over time. The translator’s goal was to produce a translation in the vernacular (the current speech of that day), and our goal today should be to use a translation in the vernacular. He answers 10 objections to reading the Bible in the vernacular. At the end of the book is a list of notes with links to articles and lots of books for further reading. Dr. Ward’s points are not from someone one the outside looking in. It’s obvious from his writings that he’s read the KJV many times. His trouble with words and phrases are real problems- not something that someone is trying to make a problem where there isn’t one. In other words, his arguments are solid, valid, and applicable to all KJV readers today. I’ve personally witnessed many of these cases where something thinks they understand a passage because they know what the words mean. I’ve heard many preachers preach about how “fast” the Word of God is while reading a verse that says the Word of God is “quick”. One preacher preached this from a Thompson Chain Reference Bible which has a glossary in the back with the word ‘quick’, but he didn’t know to look it up because he knows what the word ‘quick’ means. There are several KJV’s that provide glossaries in the back (such as the Concord, Clarion, Windsor, and Thompson Chain Reference), and others that place them in the margin or at the end of verses (such as the Westminster, Thomas Nelson Reference editions, and the Sword Study Bible), but none of them, including those with dictionaries, explain the words that Dr. Ward demonstrates. Mark Ward makes the most compelling case I’ve seen to use modern translations. It has nothing to do with manuscripts or translation philosophy. It has everything to do with language. He isn’t telling you what translation to choose. He leaves that up to you and your own research. Also, he’s not telling us to throw the KJV away. He’s simply showing, with examples, why the KJV shouldn’t be our primary translation. He’s not telling us to replace the KJV, but instead to add to it. Read it in parallel with another translation. Read another translation for a while and see what you understand. Read with understanding God’s Word as your goal. He demonstrates the need for multiple translations. He isn’t claiming that one modern translation is better than the rest, but that all have some value. 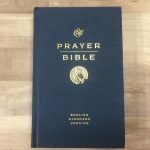 Authorized: The Use and Misuse of the King James Bible is the best book I’ve read about the need for a translation we can understand. all of his points are backed up with clear demonstrations. He isn’t attacking anyone on either side of the argument. He describes his points with illustrations that are clear. He includes the right kind and the right amount of humor. I highly recommend this book to every KJV reader. I was provided a review copy of this book by the author. I was not required to give a positive review – only an honest review. My opinions are my own. I’ll have to get this book. I love the KJV but do see it’s limitations in translation. I’m one of those weirdo’s who moved from the NASB I grew up with to the KJV. I prefer the Textus Receptus manuscripts but I also like how the KJV language was more poetic and also more formal, more serious. But now I’m seeing that “formal” isn’t necessary the correct intent of the original authors. It just sounds better, or more religious in my American-middle class-mind but that doesn’t mean that’s the correct approach. One major problem I see with the KJV is the formatting, where each verse is indented so stands alone from each other. That is not how the original authors wrote. As a homeschool mom, that’s not how I teach my kids to write. Sentences support one another in paragraphs and paragraphs support one another in a piece. I don’t even like the chapter breaks in our Bible, unless the author intended a hard break, especially in the epistles…letters don’t have “chapters”! I now make sure to use a paragraphed KJV, love my Clarion but am looking for a good Reader’s Bible as well, one that doesn’t have chapter breaks. I’ve moved my kids from KJV to MEV (another TR translation) for those types of reasons. They were struggling with sentence structure with the KJVs and now have a much easier time understanding. And I didn’t want them to use the NIV or ESV just yet. Recently, I’ve been studying the book of Matthew and in 12:20 it says, “…and smoking flax shall he not quench”. I wondered, why wouldn’t Jesus put out the fire, why just let it burn. I feel silly now that I didn’t realize sooner that the flax was referring to a wick, not a crop of flax. So a minor misunderstanding made a huge difference in a beautiful passage. 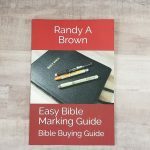 Thank you Pastor Brown for all your reviews. Your pictures that compare different Bibles are such a blessing. The KJV is a translation from Greek/Hebrew to English; it really is impossible to translate accurately “word for word” since the Greek Language is a much more mature language. The Hebrew is also a much more mature language [for a reason 😉 ] with a numbering system and a symbol applied to each Hebrew Letter. 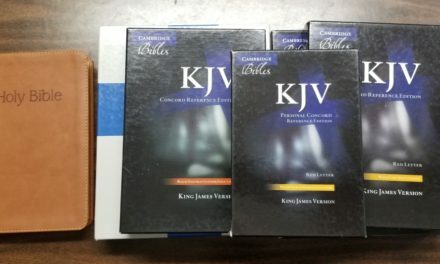 I was taught early to use the KJV and this was before the computer industry/technology sector got so big. I had such a hard time with the KJV because of it’s Old English with Modern Grammar that I got put off reading the Word of God. I wanted to know what the words meant & not just be religious reading it through once a year or relying “only” on others to teach me. Comparing a bunch of translations to the Original Greek & Hebrew was such a huge blessing in understanding that it is the “Meaning of the Inspired Words” you wanted to focus on. What was & is God saying? Then you have this CT vs. MT/TR debate. I know for a fact you can become spiritually mature to where you can here the Holy Spirit’s voice on a daily basis. Just ask the Holy Spirit what translation to use and He will guide you in spite of what some ministers or leaders around you might say. *****Please watch this short video; this issue is so simple! There is only one God and the Body of Believers as a whole should be united and not be so petty and immature over some simple principles of study & being spiritually mature in following God properly. You always want to pray & ask the Holy Spirit to lead you to the translation He would want you to use. The Holy Spirit is speaking all the time but most of the Body Christ is not mature enough to listen, not being taught right, or just not listening at all. The Gospel of the Kingdom of Heaven is a “simple message” that should explain it self, but as usual mankind gets in the way of God and that includes the Called Out Ones. The soul-body combination without a mature spiritual nature will cause one to lean more towards a religious mindset and produce poor scholarship because of a lack of seeking God’s Wisdom and seeking the leadership of the Holy Spirit. The more I look into the Septuagint which is what the Lord and the early apostles quoted from the more I am impressed with it. For the NT I recommend the NKJV being a fan of the MT/TR, but I also like NASB which is similar to the NKJV in terms of the Greek Tense & Mood, but I recommend converting this translation to a Majority Text NT & once you have all of the manuscripts combined (your own formatting of choice- brackets, etc. of adding in the variants not already listed) then let the Holy Spirit guide you as you study. A good tip in converting a CT Literal Translation (eg.- NASB, ESV, both very popular) is by using the following Kindle Book by Gary F. Zeolla: Companion Volume to the Analytical-Literal Translation (3rd Ed.) You will find all the differences of the MT-TR-CT in Section Four- Textual Variants & Alternate Readings. The MT and TR are very close which is pretty awesome considering the very few copies Desiderius Erasmus had to work with in his day. 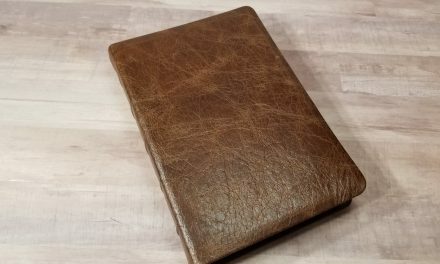 The Gideons International have a ESV MT that people have been finding in hotels I have heard as of late; would like to get a copy of these myself. But again you can do the extra adding in of the variants yourself too as just previously mentioned. So far I like what the CSB has done. Though they state this is a combination of a Formal(literal) and Dynamic Translation, I still think it could work as a candidate to convert to a MT Bible. The HCSB and CSB have a lot more textual variant notes than most CT based NT’s and this is a plus IMO. I see a few nice things in the AMP 2015 so far, but if you are not very familiar with what many call Textual Criticism I would caution you to hold off for a bit. Overall I would not use it as much as I have been using the AMP Classic. I am happy to own at least one copy for comparison/reference purposes. The KJ3 or Greens Literal Translation (KJ3 is the updated version but the same translation) is a very good translation IMO; I like it better than YLT. The NKJV Greek English Interlinear NT which also has the KJ3. The Greek-English NT by Jay P. Green Sr. which has the TR Greek, KJ3, & the KJV all on the same page. 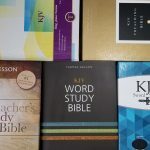 If you want to continue to use a NIV, the Message, or the NLT then I strongly urge you to PLEASE use them in conjunction with a Literal Translation as the primary and then these translations as a comparison and easy reading secondary. I think these versions/and the authors meant well, and NO it is not a satanic version, but just poor or inferior scholarship. Honestly once you get a taste of the original Greek Meanings like the ones in the “Sparkling Gems” you really won’t need these dynamic translations because they will pale in comparison. It’s so awesome to know our loving Jehovah in a actual one on one relationship and being wise in your search for the accurate meaning of what He already said on top of what He is presently saying (many books are out there right now about this) will both go hand in hand together to prepare you for what is coming. There is a lot of stuff concerning the last great move of God on Sid Roth and http://www.Charismamag.com I have had many visions and dreams in a supernatural manner over the last few years and there are many others as well experiencing this very same thing. The Church as a whole rejected the Jesus People Movement and this was of God. The Welsh & Azsua Street Revivals is what you want to study if you want to know the difference between Programs Designed by Denominations vs. God Led Revivals. This is the most exciting time for the Church (Called Out Ones) in all of history, but we must be united for our loving Jehovah to move as successfully as They want to. That was good. Thanks for sharing. Oh yes, let’s tell everyone to discard the KJV as our primary translation because this guy says so. This is yet another book that never should have been written. It’s based totally on the author’s biased opinion, and he gets the stamp of approval from critical text supporter D.A. Carson. There are so many people who should be out digging ditches instead of writing books. Instead of personal attacks, I’d rather see you handle the points he makes. Personal attacks? Not hardly. It seems no one is allowed to disagree on this website. Is it really so hard just to use the NKJV, instead of writing an entire book nitpicking and trying to dissuade people from using the KJV? He should have written about the NIV with its gender-neutrality, deceitful footnotes, and other problems. The effort put into this book speaks loud and clear of ignorant critical-text bias. Amazing, someone should write a book on how to read the AV; given, it is the only book you need to understand the Bible. I used to read volumes of commentary’s, do elaborate word studies using thousands of dollars of Bible study software … etc.. Then I learned how the AV is written to explain itself; including, the built in dictionaries of the self defining text. Today, I can’t read the RV without frustration in its inability to fully communicate the full extent of the word. Typical rubbish from modern-day critical-text scholars…who would never dream of critiquing the NIV.